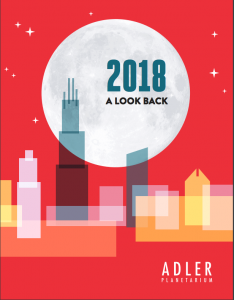 The 2018 Look Back Report has arrived! Countless journeys begin at the Adler. Take a peek at the past year and learn where our curiosity led us in 2018! Click the report to read or download. The Adler Planetarium is a 501(c)(3) charitable organization and a member of the American Association of Museums, Association of Science-Technology Centers, and Chicago’s Museums in the Park consortium of institutions located on Chicago Park District land. As a non-profit organization, The Adler Planetarium publicly discloses its financial statements and reports. Per the requirements of 42 CFR 50 Subpart F, Adler’s Federal Grant Conflict of Interest Policy is publicly available here.